This recipe comes from SchoolFamily.com's GoodNCrazy Mom, aka blogger Carissa Rogers. Rogers writes in this blog post about the role these pancakes play in her busy household, and describes them this way: "Once baked, these may look like Martian pancakes, but they're delicious and perfect for breakfast or dinner on Sundays—or any day of the week!" Place the butter in a 9x13-inch baking pan, then put the pan in the oven while the oven is preheating to melt the butter. 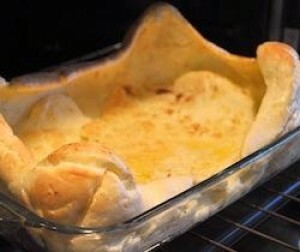 In a large bowl, mix the remaining ingredients together (eggs, flour, milk, and salt). Pour egg mixture into the melted butter (watch for hot splatters). Return the pan to the oven and bake for 15-20 minutes. Cut the pancake into squares and serve with maple syrup or sliced bananas and powdered sugar.